Actress Sheila Hancock has mentioned in an interview on BBC's Desert Island Discs that she feels happy with only one of her stage performances: that of the lesbian head-teacher of a public school, Prin in the play of the same name by Andrew Davies. 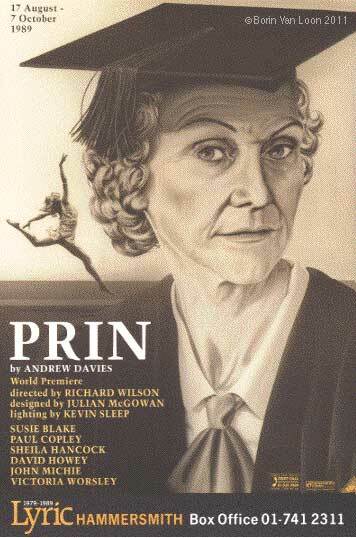 I was commissioned to create the publicity image by the Lyric Theatre, Hammersmith in London; when the play transferred to the West End, the image was used again and Miss Hancock liked the painting so much that she purchased the original. I was lucky enough to see her excellent performance at the Lyric Shaftesbury Avenue. The athletic young woman in the background is the famous figure which was – and still is – used to promote The Women's League of Health and Beauty (which had almost 100 000 members by 1936). and is now known as The Fitness League. This was specified by Sue Rolfe who commissioned the painting. In the days before internet image searches the facial likeness of Sheila Hancock was based on the photograph on the front cover of 'Jumping the queue', a novel by Mary Wesley, which the artist had to purchase for this purpose.